Not so long ago I posted a wishlist including these Russell & Bromley loafers, despite how amazing they are at £155 unfortunately my budget does not stretch that far this month. 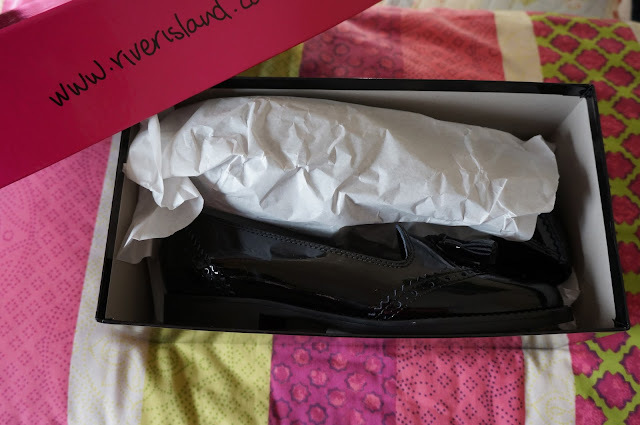 I have been trawling online for a while trying to find the perfect affordable patent loafers and then this week I found these River Island loafers! At £40 they are a fraction of the price and I am so pleased with them, they are made really well for a high street pair of shoes and they are super comfortable too. I'll be wearing theM on my trip to Winter Wonderland this week and they go so well with my Topshop black skinny ankle grazers.